TestingCup is such an exceptional event thanks to an amazing group of people. That is why we are proud to introduce to you our Golden Sponsor- Idemia. Idemia is the global leader in Augmented Identity, Digital SIM and Digital Payments with the ambition to provide a secure environment enabling citizens and consumers alike to perform their daily critical activities (such as pay, connect, travel and vote), in the physical as well as digital space. Securing their identity has become mission critical in the world we live in today. By standing for Augmented Identity, they reinvent the way they think, produce, use and protect this asset, whether for individuals or for objects. They ensure privacy and trust as well as guarantee secure, authenticated and verifiable transactions for international clients from Financial, Telecom, Identity, Public Security and IoT sectors. 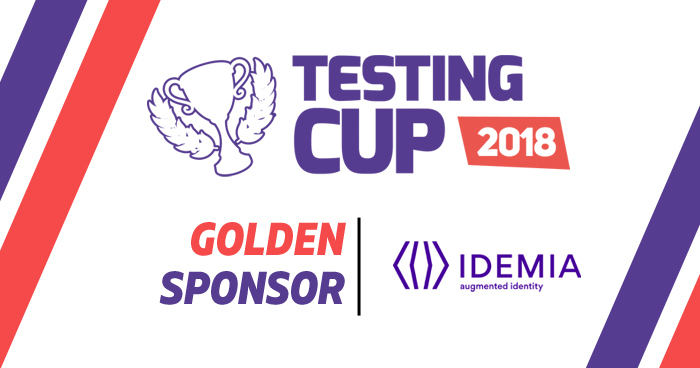 Take your chance and get to know Idemia better during TestingCup 2018!